Unlocking iphone becomes a trouble sometimes. You try and try and end up screwing and resetting the iphone settings. But Cydia is like a all time savior. You can use Cydia repository and unlock your iphone for free. Here we will use SAM method to unlock the iphone. If you have tried it but still your iphone is locked than you might have done something wrong. Just try the steps mentioned below and see if it works for you. 1.For those who don't know I want to share that this methods works only for jailbroken iOS devices since we are using Cydia. If you have jailbreak your iOS device then you don't have Cydia and this will not work for you. 2. Also you need to be connected to Wifi as downloading from Cydia sources requires internet connectivity and since we are not having a running carrier it will not help. 3. During the process iphone will reboot several time so make sure it is charged. Also see - Jailbreak iOS 8.1.2 for Cydia using TaiG tutorial [Windows users]. Here are the steps just go through them carefully and if done properly your carrier network will be clearly flashing on your home screen. 2 Go To Manage -> Sources -> Edit -> Add. Now you will see a box asking for Cydia repository "Enter Cydia/ APT URL". There enter the Cydia source URL - "http://repo.bingner.com". Click on "Add Source". 3. After the source is added. Just tap on the Bingner source and get into it. There you will find "SAM". Tap it and install it on your iphone. 4. Downloading may take sometime. Once the download is complete a "Reload Springboard" option will flash up on your home screen, tap it to continue. It will reboot the iphone. 5. Once your iOS device is rebooted go to "Settings" and select "SAM" option. Choose "Utilities" and then "Deactivate iPhone". 6. Now return back to SAM option and choose "Method". Choose "By Country and Carrier". After choosing this option tab back it will ask for your country and carrier. Enter the details. Then choose the SIM id. 7. 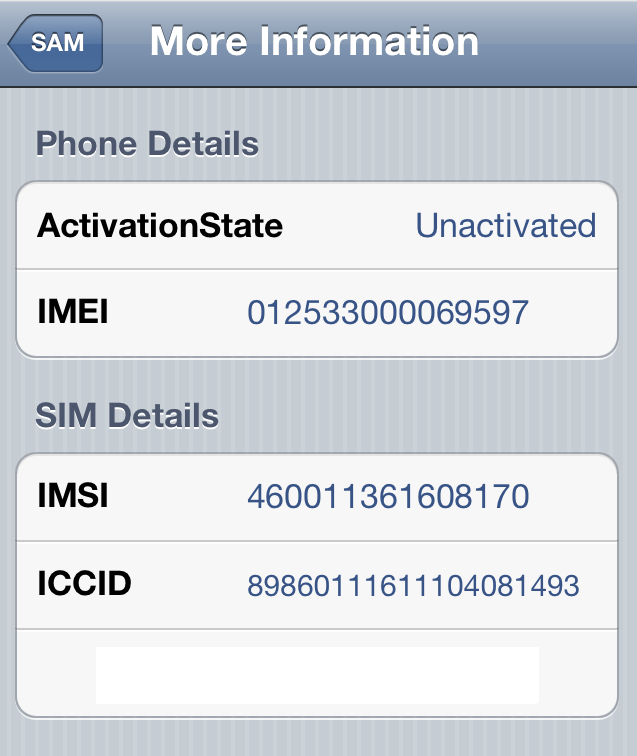 Move to "More Information" option above and copy the IMSI code under the SIM details. 8. Now tap on "Spoof real SIM to SAM". Go back and check the IMSI number. If it the same then fine else delete the number and paste the IMSI number we have copied. 9. Now go back again to "Utilities" and select "Attempt Activation". This will reboot the iphone once again. Our work is done. Now you must see signals from your carrier flashing on your iphone screen. Also see - Cydia Unlocks - What is Cydia? Still Not Done? Don' t Panic - Go On! But even after rebooting you still see "No Service" notification flashing on your home screen. No need to panic. Some settings might have been disturbed. Let's check them. 1. First go to Settings -> SAM -> More Information and make sure your IMEI matches your iTunes IMEI. If it does then try next step. 2. Go to Settings -> General -> Restore -> Reset -> Reset Network Settings. Now your iphone will reboot again. And this time hopefully it should show the signals because everything is properly set. These were some simple steps to unlock iphone using Cydia. Do check for more updates on this blog, enjoy! What happens to the old sim? Could I use it in other phones still? After I download it and go to settings to click on "SAM" it says there was an error loading the preferences bundle. what do I do?? I had the same problem once. I couldn’t install SAM properly and got red errors like: ”trying to overwritte..”………..”sub-process”……….. That was probably because my cydia was not updated or i had an old version. So after getting those errors i deleted SAM. Then I reinstalled the latest version of redsnow to my iphone without deleting the previous cydia i had installed, and from there i did the unlock steps and worked great!! we do have same problem, have you resolve it? If I don't have the original sim will it work?? will this work on iphone 4? or did apple pattch this method ?